This is one of the easiest Asian Thai mussels recipes to whip up. This Steamed Mussels with Soup is rich with Asian flavors of red curry paste, lemongrass and ginger – you’ll slurp it right up! Dairy Free and Gluten Free, too. This tops the list of my favourite Thai mussels dishes. For a long time I was too intimidated by the mussel cleaning process to tackle making them at home, but ever since I finally dared to do it (starting with a mussels in white wine sauce) I’ve made them numerous times. This recipe though is truly perfect. 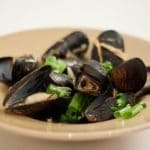 I feel that mussels usually are served best as an appetizer – still requiring you to come up with a main dish that pairs with the shellfish starter. 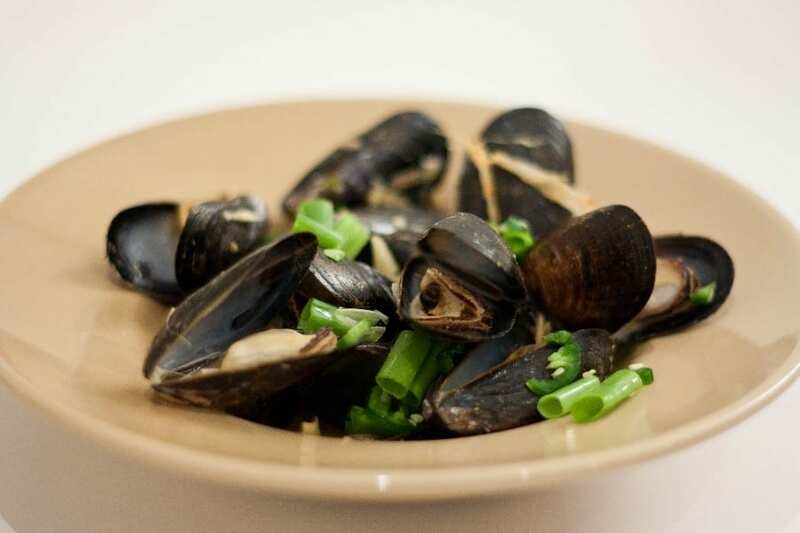 In this case though, the mussels enhance the flavor of the Asian fish soup entree all the while supplying your guests with a two course meal. 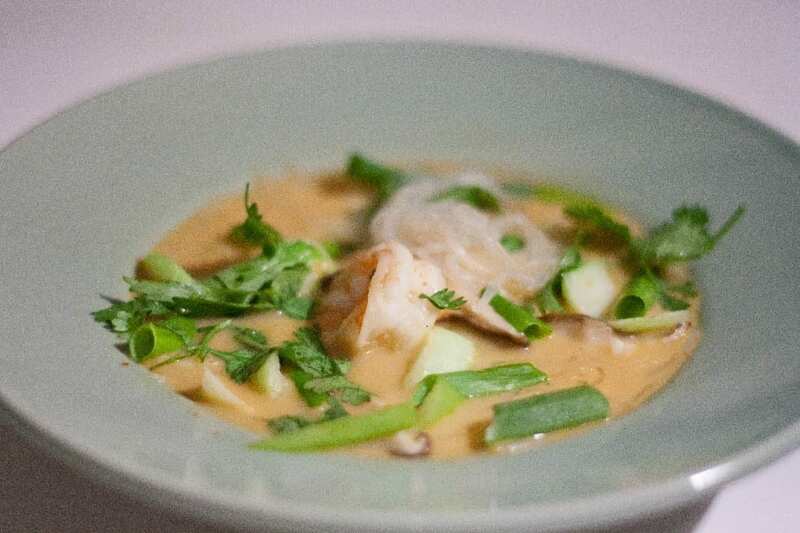 Make sure to use good quality fish sauce and coconut milk – it makes all the difference. If you can’t find fresh lemongrass the minced tube paste can be substituted but the flavor won’t be as bold (and trust me the aromatic combination of lemongrass and red curry paste is to die for). I have been meaning to make my own red curry paste from scratch because I’m sure it would be significantly better but for now the jarred/canned variety will have to do. Look out for more Asian Thai mussels recipes from me, or share yours with us in the comments! Thai Mussels with Soup rich with Asian flavors of red curry pasta, lemongrass and ginger - you'll slurp it right up! In a wok or large pot, turn heat to medium. When wok is hot but not smoking, add 2 tablespoons curry paste and the lemongrass. Fry for 30 seconds to release the flavors. Add the clam juice, white wine, fish sauce, sugar, coconut milk and ginger. Simmer for 3 minutes. Add more curry paste for a spicier broth. To Steam the mussels: Turn the heat to high and add the mussels. Cover with tight fitting lid. Steam on high for 4-5 minutes. Open lid stir mussels to move them around and cook for another 30 seconds. Remove mussels and sprinkle with scallions and chili. Discard mussels that have not opened. For soup bring liquid mixture to a boil. Add shrimp and shiitake mushrooms. Bring to a boil again and reduce heat, cooking until shrimp is cooked through. Add sliced bok choy remove from heat. Ladle a handful of bean thread noodles into a soup bowl, top with soup and sprinkle with scallions, cilantro and sriracha. I like the description of flavors you have made, and I love mussels, it was delicious for sure. I have to start trying more exotic flavors with seafood! The recipe required quite a set of ingredients but it didn’t take too long to make and both the mussels and soup were equally delicious!